HMS Hawke: Sixty two confirmed Irish sailors lost, of which forty nine are known to be Ulstermen. During the week when the Royal Navy traditionally remembers the Immortal Memory of Admiral Nelson and his final victory at the Battle of Trafalgar in 1805, it is worth pausing to reflect on the centenary of a naval incident that had a significant impact on so many Ulster families, the sinking of HMS Hawke. 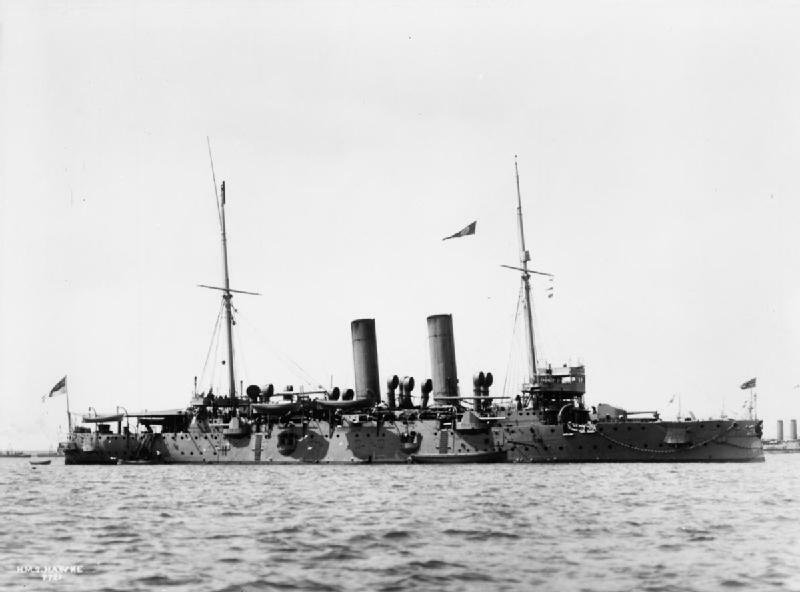 One of the greatest single losses of Royal Navy sailors from Ulster, this incident occurred on the 15th October 1914 when the German Submarine U-9 which was patrolling the North Sea came across two British Cruisers HMS Hawke and her sister ship HMS Theseus. Under the command of German hero Commander Weddigen, U-9 fired on the British ships. This was the same German submarine which had caused the deaths of almost 1,500 British seamen only 3 weeks earlier with the torpedoing of the ‘Livebait Squadron’. The submarine’s first torpedo hit HMS Hawke, igniting a magazine and causing a tremendous explosion which ripped much of the ship apart. Hawke sank in a few minutes with the loss of her Commander and 523 men. Only 74 men were saved. Sailors from Ulster lost on Hawke included the tragic loss of three fathers-to-be, leaving pregnant wives to fend for themselves throughout the difficult war years. –Leading Stoker Joyce Power left young twins and a pregnant wife in Ballymena. His daughter Margaret Hawke Power named after the ship he was killed on. -Also drowned was Able Seaman Albert Patterson Wilson whose first daughter Frances was born only 4 weeks later on 14 November. -Mariette Isabella Donald was born at the end of 1914, her father Martie Donald not returning to Carrickfergus to meet his newborn daughter. -The Gorman siblings from Clifton Park in Belfast lost one brother, Charles on HMS Pathfinder in September only to hear of the death of another brother, Able Seaman James Toland Gorman, only one month later on HMS Hawke. -Sullatober Flute band from Carrickfergus who lost one of their players Henry McMurran on HMS Cressy just 3 weeks before, suffered yet another tragedy with the loss of another member, Stoker (1st class) Andrew McAllister. -Another loss for Ulster was Lieutenant Commander Ruric Henry Waring, the first of the sons of Colonel Thomas Waring JP of Waringstown to be killed. Ruric’s younger brother Major Holt Waring would be killed in 1918 at the Front. In August 1914, at the outbreak of the First World War, Hawke was part of the 10th Cruiser Squadron, operating on blockade duties between the Shetland Islands and Norway. In October 1914, the 10th Cruiser Squadron was deployed further south in the North Sea as part of efforts to stop German warships from attacking a troop convoy from Canada. On 15 October, the squadron was on patrol off Aberdeen and HMS Hawke stopped at 0930 to pick up mail from her sister ship HMS Endymion. Hawke proceeded to return to her station without zig-zagging to avoid danger, and was out of sight of the rest of the Squadron when a single torpedo from U-9 struck Hawke and she quickly capsized. The remainder of the Squadron only realised something was wrong when, after a further, unsuccessful attack on Theseus, they were ordered to retreat and no response was received from Hawke. The destroyer Swift was dispatched from Scapa Flow to search for Hawke and found a raft carrying 22 men, while a boat with a further 49 survivors was rescued by a Norwegian steamer. 524 men drowned, including the ship’s Captain, Hugh P. E. T. Williams, and 49 Ulstermen. Only 74 men were saved, of which 6 were from Ulster. None of these men’s bodies was recovered for burial, most remaining where they drowned. The centenary of the sinking of HMS Hawke and the tragic loss of so many men of Ulster will be remembered at the Royal Navy’s annual Trafalgar Day Service in Belfast on 19th October 2014. *Three years before, on 20 September 1911, Hawke, under command of Commander W. F. Blunt, collided in the Solent with the White Star liner RMS Olympic. In the course of the collision, Hawke lost her bow. The subsequent trial pronounced Hawke to be free from any blame. During the trial, a theory was advanced that the large amount of water displaced by the Olympic had generated a suction that had drawn Hawke off course. The decision of the first court to try the case provoked a series of legal appeals. *There were 6 known Ulster men who survived the tragedy. These were: Charles Trainer from Derry, JA Allen from Belfast, Thomas H Doyle from Belfast, Thomas Hoy from Larne, John Aitken, from Belfast and James O’Neill, from Belfast. *William Hull from NOW assisted with this research.